I remember the day I heard. May 13th 2011 the internationally renowned American artist, Stephen De Staebler, died. Ashes to ashes, dust to dust, Stephen had now returned to the earth that was such an integral part of his work. Matter and Spirit was the title of the retrospective exhibition and monograph he was working on with the Fine Arts Museum of San Francisco in the final year of his life. These two words neatly summarize his visual body of work, his professional practice of over 50 years and his contribution in sustaining the figurative tradition in post war American sculpture. Earth and spirit– two conversions–fueled his work. His first conversion owes much to Saint Francis of Assisi. For Francis spirituality is revealed not by our perfection or rational capacities, but in acceptance of our own imperfections, incompleteness, limitedness, and flaws. Francis embodied a lived active spiritual practice that Stephen embraced and emulated. Stephen admired Francis’ balance of will and spontaneity and his radical trust of emotional, intuitive and poetic knowing. The famous regard that Francis held for the natural world is mirrored clearly in Stephen’s work, but more fundamentally he learned from Francis to honor intuition in making and that through woundedness rather than perfection spirituality is made manifest. His second conversion entailed letting clay be clay. He did not so much work with clay as collaborate with it, trusting its inherent characteristics, showing profound respect for clay’s particularities, states and accidents, which he likened to the flesh and bone of bodies. His figures are equally flesh and equally earth, and rely on the givenness of clay, the creativity of accident, the inescapability of gravity and respect for mundane material matter. I know of no one, except perhaps Rainer Maria Rilke, who so profoundly revealed the spark of the transcendent embedded within the material realm, and for whom the entire created realm proclaimed God’s existence. Grace and gravity, matter and spirit. Mirroring Simone Weil’s pairing of the downward pull of gravity against the upward pull of grace as elemental forces, De Staebler’s sculpture Yoke Winged Man is simultaneously of the earth and of the spirit, acknowledging the downward pull of gravity and upward trajectory of grace, simultaneously dying and rising, suffering and ascending. Referring to De Staebler’s sculptures, eminent art critic Donald Kuspit identifies that it is precisely this concern with suffering that identifies art as religious. In this piece a protective cowl wing ascends attempting to lift against the force of gravity. Fully earth and fully flesh the body is broken, fragmentary and striving to fly. Similarly Man with Tar Heart references human woundedness and divine spark. In Yoke Winged Man the heart area is red and a white X marks the spot of necessary emotional intelligence. The heart cavity in Man with Tar Heart is actually filled with tar, the torso wounded with a vertical incision. 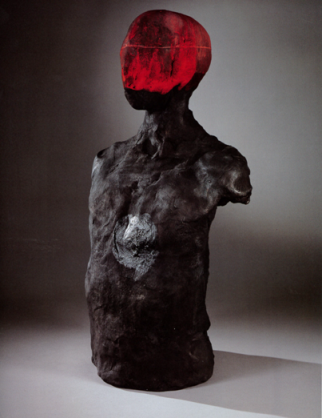 This charred human torso is De Staebler’s self-portrait. A commissioned bust typically serves a commemorative funerary function. About it he writes, “I think everyone feels inadequacies, incompleteness; and of course the worst of society is trying to pretend you do not have these limitations, violating possibly irreparably your own uniqueness, which is largely a factor of incompleteness.” Here we have De Staebler’s own funerary stele fully earth, fully fire, returned to nature, eroded by time, flame-faced and holy. Using a language of texture and form, De Staebler sought to transform suffering, creating a modern religious art, utilizing archaic forms for an ‘archaic’ purpose: the articulation and remediation of suffering. Ashes to ashes, dust to dust, Stephen has now returned to the earth he so loved, drew inspiration from and out of which he teased the face of God. 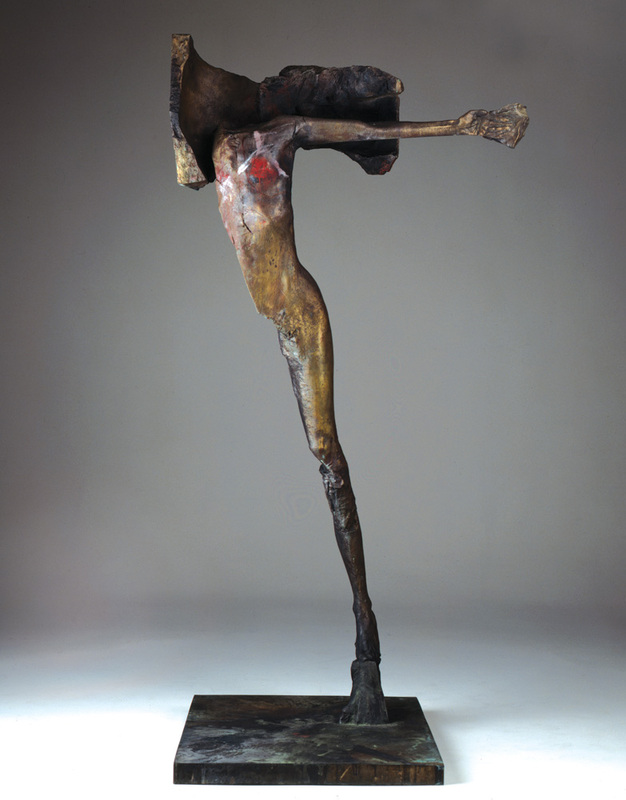 Stephen De Staebler: Yoke Winged Man, 1999, bronze, oil paint and patina. Collection of Russ Solomon, Sacramento, California, USA. Stephen De Staebler: Man with Tar Heart, 1981, bronze, 26.5 x 15.5 x 9 inches, Collection of John Williams, San Francisco, California, USA. Stephen De Staebler (1933-2011) created figurative sculptures primarily from clay, a medium derived from the primordial earth. Drawing inspiration from fundamental childhood experiences with nature, a transformative adolescent encounter with mortality and adult studies in the histories of art and religion, he explored and extended a tradition of human representation that includes the religious monuments of ancient Egypt, the Renaissance humanism of Michelangelo’s finished and unfinished figures and the modern existentialism expressed in the works of Alberto Giacometti. See www.stephendestaebler.com. Erica L. Grimm, PhD., is a Canadian artist, researcher and educator whose work is exhibited widely and held in collections across North America. Currently she is Associate Professor of the Arts, Media and Culture at Trinity Western University, Langley, BC, Canada. She specializes in drawing, intermedia, aesthetics and cultural theory. See www.egrimmvance.com and www.twu.ca/academics/faculty/profiles/grimm-vance-erica.html.